For a lot of people, taking a hike through a wooded park or wildlife sanctuary on a beautiful day is an invigorating, peaceful, even meditative experience. But that's not always the case for everyone. “It can be scary to be in an unfamiliar environment," Jerry Berrier told me. Berrier has been blind since birth. But he’s also a lifelong birder who loves the outdoors. Berrier birds by ear and records their calls and songs whenever he gets the chance. Now Berrier can venture safely along a nature trail — on his own — more easily. 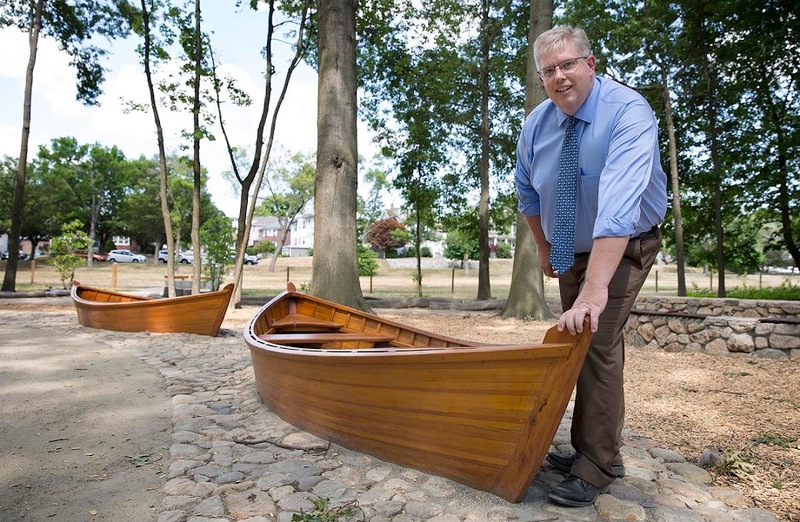 That's because the state Department of Conservation and Recreation built a specially designed, accessible park very close to where he works at the Perkins School for the Blind. 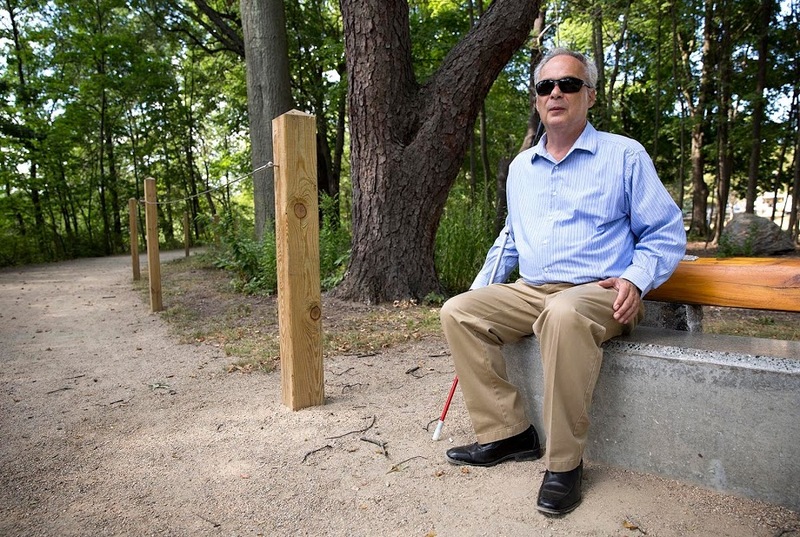 “It is difficult for me as a person who’s totally blind to find places where I can spend an hour or two, or longer, all by myself if I choose to,” Berrier said while sitting on a bench on the Watertown Riverfront Park and Braille Trail along the Charles River. Berrier hopes the Braille trail in Watertown will inspire people of all abilities to engage more deeply with nature. He says spending time outside opens his world, which he says can sometimes feel small when you have a disability. And it's helped Berrier discover other ways to find and experience beauty, since he's not able to see it. Accessible trails with wider, rope-guided paths like the one in Watertown have been cropping up around the state, thanks in part to Berrier. “I've very committed to that and have been for a long time,” he said. For the past eight years Berrier has been an “accessibility consultant” to the Massachusetts Audubon Society. With his help, the organization is currently upgrading its 12th "All Persons Trail” with multi-sensory elements at the Habitat Wildlife and Education Center in Belmont. On a recent, sun-filled morning, Audubon staff and volunteers raked a walkway and measured distances. They’d been doing a lot of prepping to install nine stop posts for rope guides along a stretch of a half-mile loop. Half a million people visit Mass Audubon sanctuaries a year. Education projects manager Lucy Gertz said her goal is to boost that number because connecting people with nature is the organization’s core mission. The Audubon's All Persons Trails have gently graded graveled or paved paths that make it easier for people with wheelchairs or mobility issues to navigate. Some include interpretive signs in both English and braille describing local ecology and history. There are tactile maps and brochures, too. Berrier has been using his audio skills to record and engineer audio tours people can dial up on their smartphones. One new audio tour Berrier produced for the Belmont trail describes the small plots of land in the sanctuary’s community garden, its solar array and the trees overhead. Berrier is also one of the accessibility testers who have experience working with people who have a wide range of disabilities. Habitat director Roger Wrubel says the testers provided useful, critical feedback on the audio tour’s script, the trail itself and the interpretive stops that would be most compelling. For example, Wrubel's team added more benches so disabled visitors can take rests along the way. And he says, thanks to Berrier, there’s a moment on the audio tour that encourages visitors to feel the different tree barks and even wrap their arms around a trunk. Wrubel says this safer trail is attracting more elderly people from assisted living homes and families with strollers, too. But making outdoor areas more accessible comes with challenges. Most importantly, Gertz says the trails must comply with the Americans with Disabilities Act (ADA). Staff and volunteers have to be trained on the law, but she adds that there’s a cultural component as well. Not everyone understands the etiquette it might take to make people who rely on wheelchairs or service animals feel welcome. In 2010 the organization received a $100,000 federal grant from the Institute for Museum and Library Sciences for its All Persons Trails Project. And Gertz’s team has created a free, 70-page “how-to” manual and video that's available online for other organizations hoping to design their own accessible trails. The state-operated braille trail in Watertown cost $1.5 million and includes a beautifully crafted "sensory park" with an interactive instrument called the Braille Marimba. There are sculpture-like picnic tables, stone benches with smooth, polished surfaces and a rope guide with different shaped wooden blocks that indicate points of interest and plaques with information in braille. Norman Orrall, chief of planning and engineering for the DCR, says making outdoor resources more available to more people is a priority for the Baker administration. 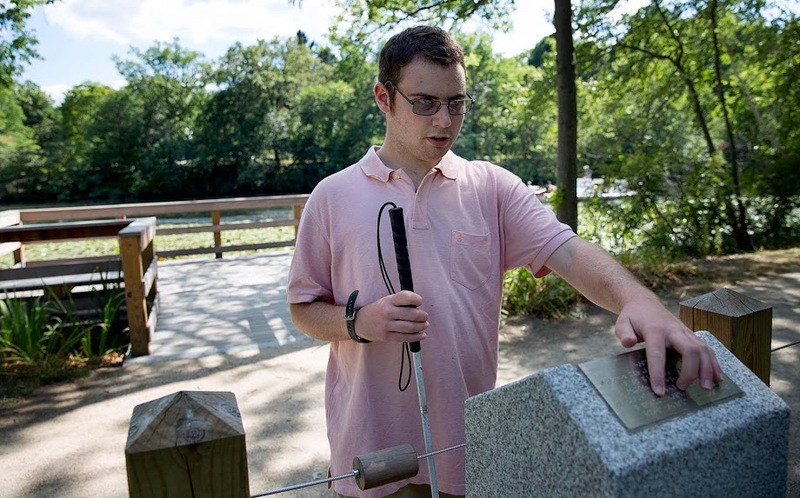 Orrall calls designing the braille trail — with help from the Perkins School — eye-opening. Berrier is pleased with the way the braille trail in Watertown turned out. As we walked along a trail that runs parallel to the water we stopped at a granite pillar with some text. Berrier reached over and read about how the 20 dams built to power industry along the 80-mile-long river caused decades of pollution. “The braille is good, the material it’s on feels pretty durable,” he offered as a critique. Berrier hopes other people with disabilities, especially the young students where he works with nearby at Perkins, will come to the trail a lot. One of them, Tom Pelletier, stopped to read a sign post during his stroll through the trail. The 20-year-old told me he could do without the history and geology lessons. But Pelletier — who has partial sight due to a cortical visual impairment — was clearly taken by the nature around him. Jacob Augenstern, Pelletier’s therapeutic support person, stood a few feet away and said a trail like this can really make a difference.